One of the biggest problems with doing these sensitive observations is the contamination by foreground radio sources. At the observing frequency of 30 GHz many of these sources are highly variable and so the onlysure way of removing them to monitor them at the same time with a telescope with a greater collecting area (and hence flux sensitivity). Suspect sources were found using the Cambridge Ryle telescope at 15 GHz, which will detect any sources likely to cause trouble to the VSA at 30 GHz. 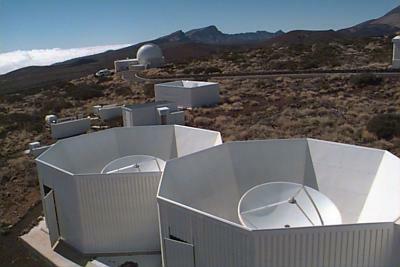 These source are then observered with the "Source Subtracter", two 3.7 m parabolic dishes stationed just to the south of the main VSA telescope, to monitor the fluxes of these source so that their effect can be accurately removed in the final analysis of the angular power spectrum. The same receiver-antennas are used as on the VSA with the horn reflector servering as a teriary mirror collecting the microwave radiation from the Cassegrain hole.